The YoYoJam ENEMƎ (aka Enemy or Eneme) was a full metal jacketed version of YoYoJam's X-Convict yo-yo model. It was also the signature model of Johnnie DelValle--one of several of his signature YoYoJam models--and was officially released shortly after the 2009 World Yo-Yo Contest. DelValle used a stock, off-the-shelf YoYoJam Hitman yo-yo to become the 2003 1A World Yo-Yo Champion. 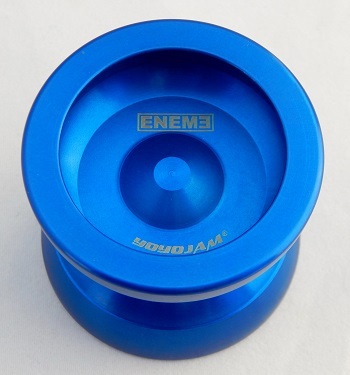 Made in the USA, the Eneme is an undersized aluminum throw that has a butterfly profile and uses a full size C YoYoJam-branded ball bearing and YoYoJam branded silicon pads for response. Original retail price: $92 US. To see all mini yo-yos in this museum, in the left panel, click Exhibits. In the right pane, in the Name/Model field, type mini, then click Browse.